Special treat this week: Sandy's Mother!!! (I love you Mom!) 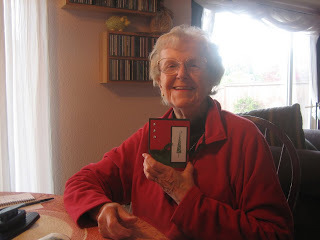 This is a photo of her making her very first card while visiting in October 2009...talent from the get-go! I got started only last Fall when I visited my daughter, Sandy (your fearless and talented leader!) as I was curious to learn about card making from the expert herself and to see Operation Write Home in action. After an intensive weeklong workshop with her, I was encouraged to try it on my own. The holidays then were enough inspiration to get me started and now I can’t quit. It truly has not been enough time to be featured here, but I guess Sandy feels that if other newbies see samples of my recent cards here, it might encourage them. Hey… if Mom can do it…anyone can, right!? Well, I have a sunporch at the back of my little house which serves as my art studio where I paint in oils, acrylics, and pastel during the day, and have set up a small area to hold my growing supply of card making tools. But I actually do the card making at my dining room table in the evenings as I need more clean space to work with paper crafting than I have beside my easel, paints and brushes. At times, I’m in that creative mode most of the day as I do enjoy it since I now have the time, and it keeps this old gal busy and out of trouble! 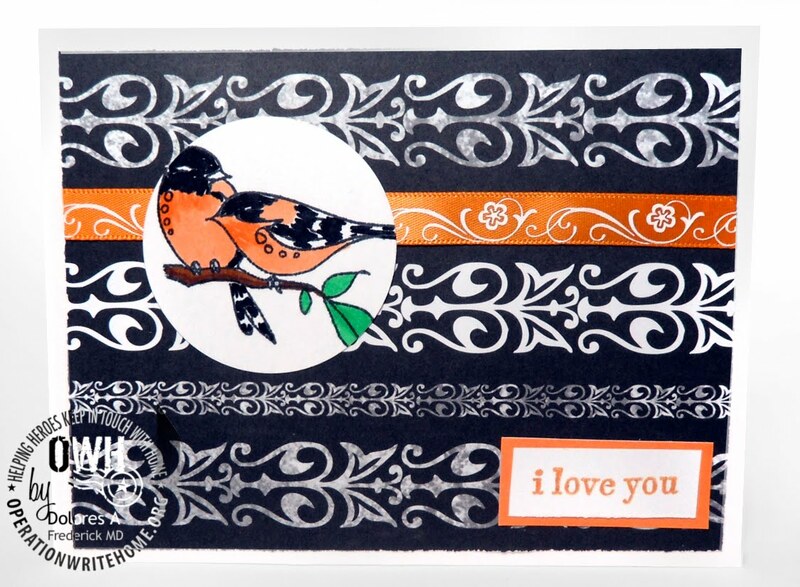 What are your favorite stamping products? Can’t say I have any favorites as yet since I’m still experimenting with so many tools, but I do like some of the punches, especially the butterflies, and enjoy coloring stamped images with the Copic markers. I haven’t developed an actual technique as yet since I’m still learning through magazines, tutorials, and following the talented OWH bloggers. I like the challenge of working up a design and coordinating the papers and embellishments to fit it. My favorite color is red, but I don’t feel it has to be in my card designs. 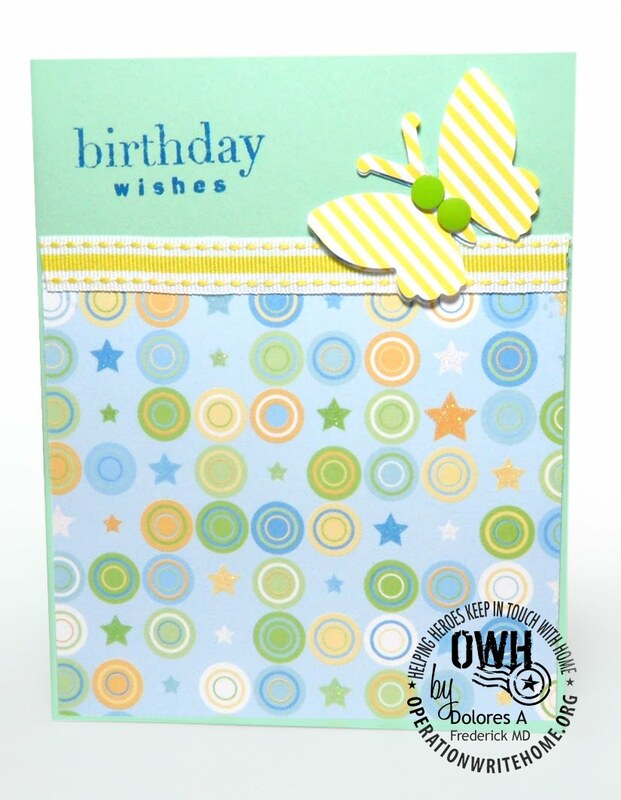 I choose colors that coordinate with a particular stamped image or embellishment based on the theme of the card. What did you think of Sandy's "card factory?" Because of Sandy’s involvement, I’ve known a little about the project for a long time, but didn’t really “know” how it worked. I couldn’t believe the amount of mail that arrives at her mailbox each day (as well as the other two shippers). Just opening all of the mail, counting/sorting the cards into categories, checking that they are stamped, liners in dark cards, repairing those in need… and… only then being able to add the envelopes for each card and pack varieties into the boxes for the military contacts. They need to be sealed and addressed, loaded into the car, and driven to the nearest post office…then unloaded onto a rolling cart to get inside the door and to the clerk for postage and sending. Of course, needless to remind you of all the ongoing records that must be kept, and the time spent online reporting all activities to you across the nation and keeping you motivated . As much as we all enjoy making these cards for our heroes and sending them to the shippers, we must realize and appreciate the big volunteer job it is for them, and it keeps on growing! I wish you all could see this for yourself as I did...it is inspiring. I remember only too well how great it was to hear from my big brother who served in the Navy during WWII, so I’m happy to be able to do something now that will encourage our heroes to write home to family and friends. I enjoy writing my own letters of support to them, and love to create cards for them to send home, knowing that their personal handwritten note to a loved one on that card will be cherished. Hi Delores, how nice to meet you! I have a friend who lives in Hagerstown, not far from you! Your cards are lovely, and one day I'd love to see some of your paintings incorporated onto your cards! Keep up the great work, and it's so nice to see Sandy's mom making beautiful cards too! Wow,wow,wow, is all I can say!!! Are you sure she's a newbie???? I look back on cards I made 2 yrs ago and frown....and I've been doing this for almost 7 yrs!!! She's a natural,just like her amazing daughter!!! And I agree....she needs a blog!!! ;) Beautiful artwork!!! What such beautiful cards! 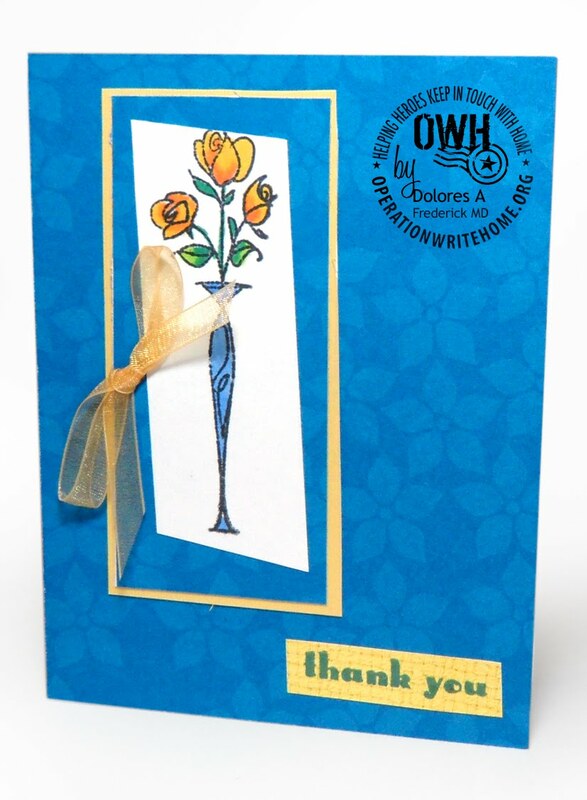 Especially I love the way of focal image attached on your Thank You card in blue. I am sure that it is much more than I can imagine how much work involved with the shippers. Thanks to them for all what they do. Thank you for sahring your creations and inspiring. WOW...the talent of both Mom and Daugther is inspirational!! Thank you for sharing your story, Dolores, and thanks for featuring your Mom, Sandy. I'm 'scared' to get involved in stamping. I guess I just need to jump in and go for it, huh? The cards that were showcased are beautiful and I can't wait to get started on some more cards for OWH! You have an artists eye & it shows in you cards. They are just beautiful. It's amazing how addicting this card making is. I hardly get any scrapbooks done anymore. Great, great job Delores!! Keep up the good work and hope to see more of your cards. Yes, when I first started, I wouldn't have shown them much, but I've improved over the last 5 years! Thanks for sharing! Such beautiful artwork! You'd never know you've been stamping for such a short time! Woo hoo! Dolores! What a treat to see your work on the S&S blog! Your cards look great on here, but they're even better in person! Thanks for participating as the featured card maker. Most of all, thanks for making cards for our heroes, and thanks for raising a daughter with such a big heart for this project! Dolores, you are so inspiring to me! I know your amazing cards are filled with love. Dolores your cards are great, and your daughter pushes us all to create, create, create. Hi Dolores. You are such an inspiration. I can't believe you just started making cards such a short time ago... I guess it's just your artistic talents that make it look so effortless. Thanks so much for sharing your work & giving us a vivid picture of what Sandy & the other shippers do to keep the organization growing. It really is amazing how far it has come in such a short time too. This is the best interview I have read. I'm not saying I didn't care for all the others because I did, it is the fact that this was a Mother and Daughter event to learn where the roles were reversed. It reminds me when I was able to share my stamping hobby with my Mom. Thank You for sharing this wonderful hobby with your Mom, Sandy. And Dolores, welcome to the greatest hobby that places smiles on many, many people's faces! Welcome Dolores! Your cards look like you've been a cardmaker for years! I really like the birds. That is a sweet picture of you. You must be proud of Sandy! Ah Ha, now the truth comes out Sandy and we can all see just why you are as talented as you are... MOM!! What a wonderful Feature Friday. These cards are so beautiful that while you might be new to card making it's obvious that artistic creativity is in your blood. She's got the knack!! LOVELY cards! Now we know where all the artistic talent comes from. Fab cards. I have a great imagination and the images I get of all that goes into making the packages happen is that's its a much bigger job than the volunteers let on. 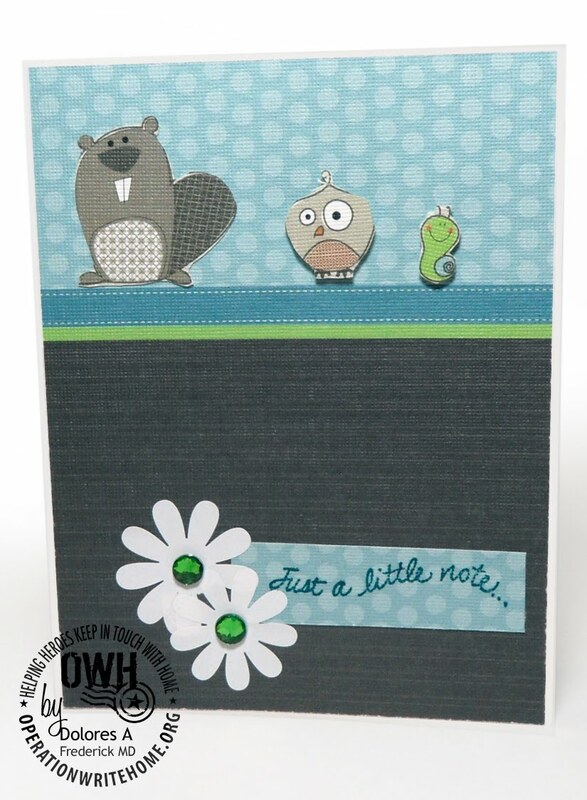 I actually have a cardmaking friend in Frederick, MD. It is so nice to meet you. 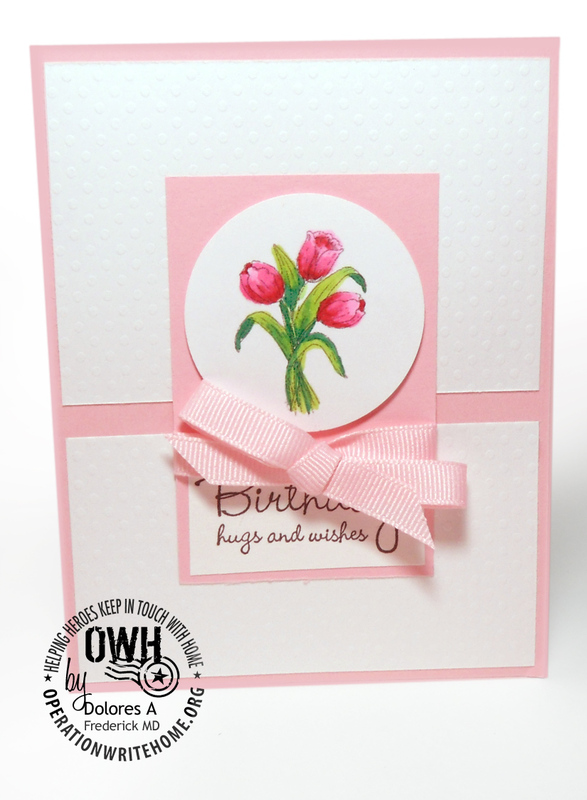 I love your cards, Dolores - they're just my style: clean and simple! and I just wish my mom would be ready to try this craft. I'm sure she'd enjoy it if she gave it a chance. WTG Mom.....That was awesome. The cards are beautiful and you are right.....Inspiration is all we need!!! Hi Delores! I can see that artistic blood runs in the family- Wow and you paint too!! We all do appreciate all the work Sandy does. You both Rock! You are just amazing now we know where Sandy gets all her talent. Your cards are great and your coloring is fantastic keep up the great work. Fantastic to meet you, Sandy's Mom! :) The story about your brother in WWII is so sweet and inspiring. 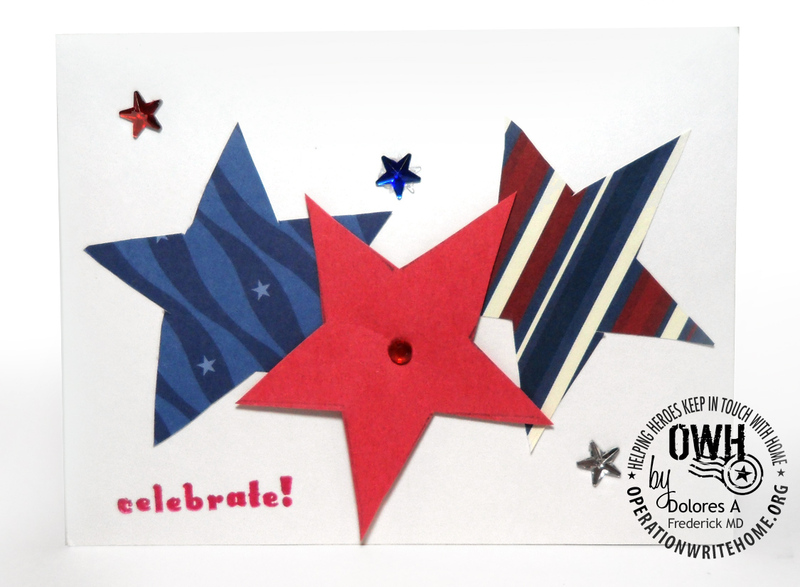 Thanks for being part of OWH! Your support for your daughter is amazing. . . oh, kleenex!!!! Regardless of how much you enjoy the cardmaking, God bless you all for the time, effort and cost that it takes to support this project for our troops. Hi Delores! Now we know where Sandy gets all her talent and energy from!!! Very nice meeting you. Welcome to OWH!